Hip Denver wedding photography by photographer Mark Creery Photography. Mark loves to capture urban Denver weddings in a cool, hip way. He doesn't shy away from the more grungy elements of what makes downtown Denver unique and interesting, so he creates fresh portraits no matter where he finds himself. 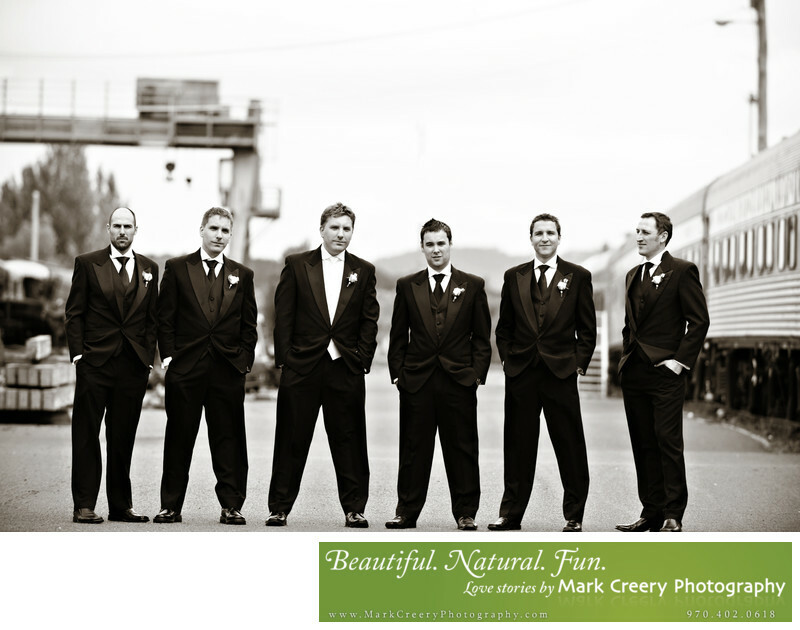 In this photo, the groomsmen were out at a train yard with an industrial feel. Mark decided to play off this feel by having the groomsmen stand in a more stiff, 'tough guy' way to come across like they mean business, but with a fun flair. The black and white finish helps to create an old-school timelessness to the photo which plays of that feeling. If you're looking for wedding photography in Denver that has a hip new feel, get in touch with Mark through his contact page and he'll be happy to chat.